As pretty much everyone in Canada learned yesterday (and no one outside the country cares to know), Canada Post, the country’s national postal service will phase out home mail delivery by 2019. The reason? It’s obvious. The internet has hammered mail volumes. There was 20% less mail delivered in 2012 than 2006. And 6 of that 20% decline occurred in 2012 alone, suggesting the pace is accelerating. First, I’m really quite happy about (the long term implications of) the demise of home delivery. For me, Canada Post has become a state sanctioned spamming infrastructure. When the little red dot on my mailbox rubs off (as it recently did) the volume of actual wanted mail versus unsolicited mail I receive runs at at least 20% versus 80%. Indeed, the average Canadian household got 1,178 flyers in 2010. About 22 a week. And that doesn’t even count unaddressed mail. I shudder to think of the colossal waste of paper and energy created by the production, shipping, delivery and recycling the essentially endless circulation of this vast pulp forrest. All the more so given less than 3% probably ever gets looked at, much less read. The problem is, in the short term at least, things may get worse. Or at least messier. One way of thinking about this change is that your front door just got massively deregulated. I suspect a whole new level of unwanted and unsolicited mail spam is about to hit the more densely populated swaths of the country. So much so, I expect we are going to see – in fact demand – new legislation to regulate physical spam. Up until now the cheapest way to send you spam – unsolicited mail or even just targeted advertising – was via the post person. Indeed Canada Post has long depended on this – generally unwanted – mail. You may remember in May, in one of the saddest public campaigns ever launched, Canada Post tried persuading Canadians that Junk mail was good for them. So there are two implications of the change. The first, as the photo above testifies, is that some – maybe even many advertisers, will feel like their mailers are less effective. They will of course actually know this, since the ROI on mailers is a pretty exact, and measured, science. The second is that the largest player in the delivery of pulp to peoples homes business will have retreated away from… the home. Leaving a big demand to be filled by new entrants. What does that mean? Well hopefully, in the long term, junk mail proves less and less effective a means of selling things. But I suspect that there will always be an advantage to shoveling 30 flyers a week onto your front stoop. So I can imagine another long term trend. In 2010 the government passed anti-spam legislation that focused on, the digital form of spam. So while I’m quite confident this law will have close to zero impact on digital spammers, for a growing number of Canadians I suspect there is little difference between online and offline spam in their mind. So much so that, it would not surprise me if an uptick in unsolicited flyers and mailers to people’s door – where they no longer get actual mail – make real anti-spam legislation a political winner. Indeed, a clever opposition party, wanting to show the more ill-conceived elements of the government’s plan, burnish its environmental credentials and own the idea early, might even propose it. Will we get there? I don’t know. But if we just unleashed a wave of new spam and flyers on Canadians, I hope some new tool emerges that allows Canadians to say no to unsolicited junk. This entry was posted in canadian politics, public policy and tagged Canada post, environment, public policy, spam on December 12, 2013 by David Eaves. Looking around I’ve found a number of bylaws about distributing handbills and flyers in commercial settings or on the streets. Edmonton has a good example here: http://www.edmonton.ca/bylaws_licences/bylaws/handbills-and-flyers.aspx and Vancouver has similar things in PDF about street distribution. I agree that it seems like a private distribution could be on its way. The laws about trespassing aren’t usually clear for people distributing flyers to residences. In the states it’s illegal to put flyers in a postal mailbox if it wasn’t mailed. Not sure about that here and even so if they change the location of delivery your house might not be a postal box anymore anyway. I’d expect the people delivering menus to branch out into the new world of private flyer distribution. Also wondering what effect this will have on paper/flyer recycling in the aggregate for the city. Ever since moving to Canada in 2009 I wondered about this and other paradoxes in Canadian environmentalism. How do we have so many flyers and useless junk printed every single week, and then encourage saving trees? I mean this in the sense that I have met almost no one who seems to care about this. (More context: I live in a suburb and we have always had a community mailbox; every week, 90% of it is ads,coupons,and flyers). Also, related: Why exactly are all the lights open in almost all schools all night long, when we make such a big deal out of Earth Day and turn off the lights for a symbolic hour? 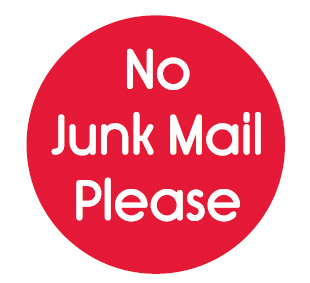 Firstly I hate junk mail and think it is a tremendous waste However I agree with clarkbw, I don’t think the junk mail problem will get worse. People can request Canada post not to send flyers and they must adhere. It was the first thing I requested once In a new location. Canada post has to deliver any mail that has your address on it. everyone to use the internet? Or some other scheme to cater to business owners. How will people in remote areas get their “mail”? Who thinks this stuff up! The USPS does serve one useful purpose, though (and probably the same can be said for CP). Its package delivery business helps keep prices low. Without it, UPS and Fedex would dominate the entire industry. The letter delivery business — what legitimate portion of it still exists outside of all the spam — should be folded into the package delivery business side. My only concern is that the replacement to home delivery is an internet that is not publicly owned like the USPS was originally. There is no requirement of universal service such as is demanded of the postal services; the private operators can charge as much as they want and continue consolidating until they have a near monopoly like the US and Canadian postal services have for physical mail. I’d like to see public oversight of the actual operators of OUR Internet. But other than that, I think electronic transmission of messages is a good way to save forests, not to mention a lot faster.